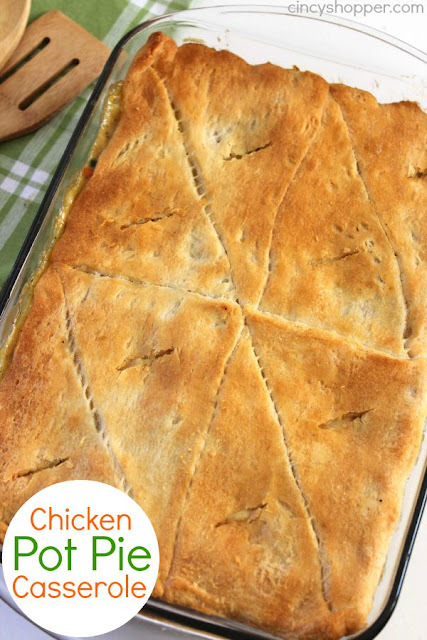 Add this easy Chicken Pot Pie Casserole to your quick weeknight dinner idea list. Pot Pies make for a comforting meal during the fall and winter months. Since this recipe uses store bought crescent rolls for the crust, it comes together quite easily. You can grill a few chicken breasts or use a store bought rotisserie chicken too. 2 cans Refrigerated Crescent Rolls. Grill chicken breasts until cooked through. Allow to cool. Grill diced onions until transparent. Set aside. Dice chicken into 1/2" cubes. Grease a 11x13" baking dish. Unroll 1 can of crescent rolls and pinch perforations to seal into a sheet. Press into bottom and up sides of prepared disk. Don't worry if sides do not go all the way up. Bake for 20 minutes or until crust is light brown. In a large skillet, combine chicken cubes, diced onion, water, potatoes and peas and carrots. Stir and cook over medium heat until ingredients are warm (5-10 minutes). Add soup and poultry seasoning and continue heating for another 5 minutes. If sauce looks too thick, slowly add a little more water until desired consistency is reached. Pour chicken mixture over baked crust and spread evenly. Unroll other can of crescent rolls and pinch perforations to seal into a sheet. Place over top of chicken mixture and press into sides of dish. Bake for 25 minutes or until top is golden brown. 0 Response to "CHICKEN POT PIE CASSEROLE"